High in fibre. Suitable for vegans.Sea vegetables have long been enjoyed for their distinct flavour and their versatility. 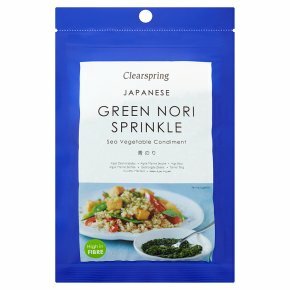 Clearspring dried Green Nori Sprinkle makes a tasty and nourishing condiment for a variety of savoury foods. For a herb-like flavour, sprinkle on pizza and pasta, rice and noodles, vegetables, soups and salads. Also delicious in breads, muffins and crêpes, sauces, dressings and dips.